See PDF Technology Notes for information on user agent and assistive technology support. The intent of this technique is to ensure that users can navigate through content in a logical order that is consistent with the meaning of the content. Correct tab and reading order is typically accomplished using a tool for authoring PDF. If the reading order is not correct, keyboard and assistive technology users may not be able to understand the content. For example, some documents use multiple columns, and the reading order is clear visually to sighted users as flowing from the top to the bottom of the first column, then to the top of the next column. But if the document is not properly tagged, a screen reader may read the document from top to bottom, across both columns, interpreting them as one column. The simplest way to ensure correct reading order is to structure the document correctly in the authoring tool used to create the document, before conversion to tagged PDF. Note, however, that pages with complex layouts with graphics, tables, footnotes, side-bars, form fields, and other elements may not convert to tagged PDF in the correct reading order. These inconsistencies must then be corrected with repair tools such as Acrobat Pro. Form fields missing from the tagged content. Form fields in the wrong location in the PDF content; e.g., at the end of non-interactive content. This example is shown with Microsoft Word. There are other software tools that perform similar functions. See the list of other software tools in PDF Authoring Tools that Provide Accessibility Support. 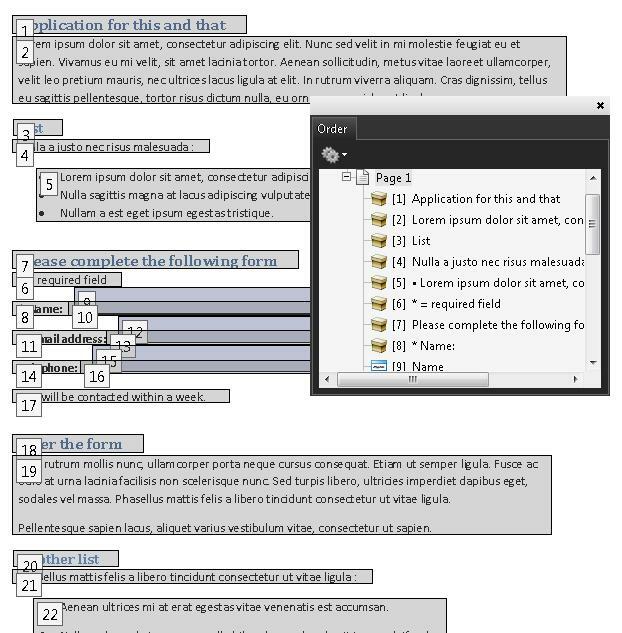 Multi-column documents created using Word's Page Layout > Columns... tool typically are in the correct reading order when converted to tagged PDF. 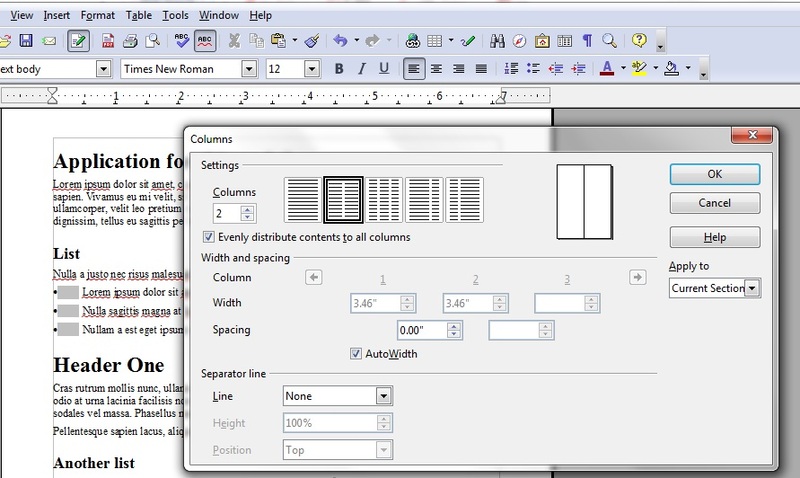 The image below shows Word's Columns tool. This example is shown in operation in the working example of 2-column document using Word 2007 (Word file) and working example of 2-column document using Word 2007 (PDF file). This example is shown with OpenOffice.org Writer. There are other software tools that perform similar functions. 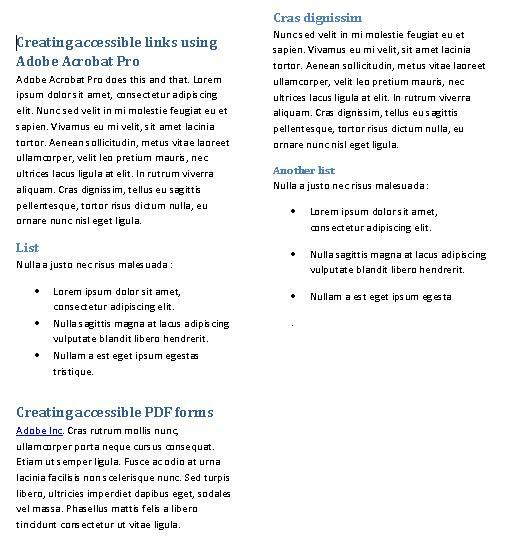 See the list of other software tools in PDF Authoring Tools that Provide Accessibility Support. Multi-column documents created using OpenOffice.org Writer's Format > Columns... tool typically are in the correct reading order when converted to tagged PDF. 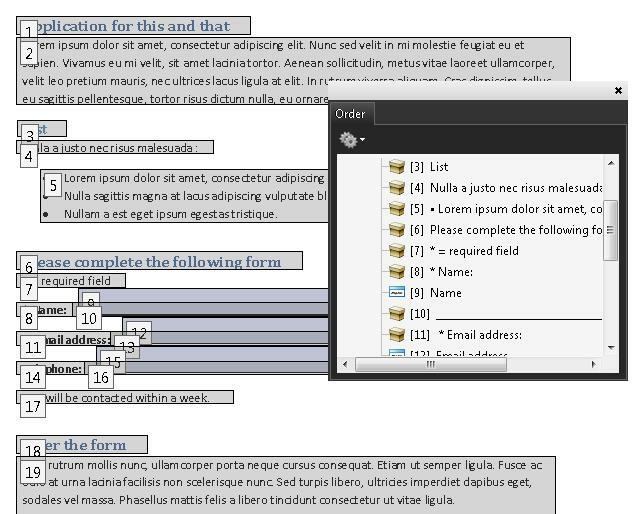 The image below shows Writer's Columns tool. This example is shown in operation in the working example of 2-column document using OpenOffice Writer (OpenOffice file) and working example of 2-column document using OpenOffice Writer (PDF file). Select one or more page thumbnails. Select the Tab Order tab in the Page Properties dialog. Use Row Order Tabs from the upper left field, moving first left to right and then down, one table row at a time. Use Column Order Tabs from the upper left field, moving first from top to bottom and then across from left to right, one table column at a time. 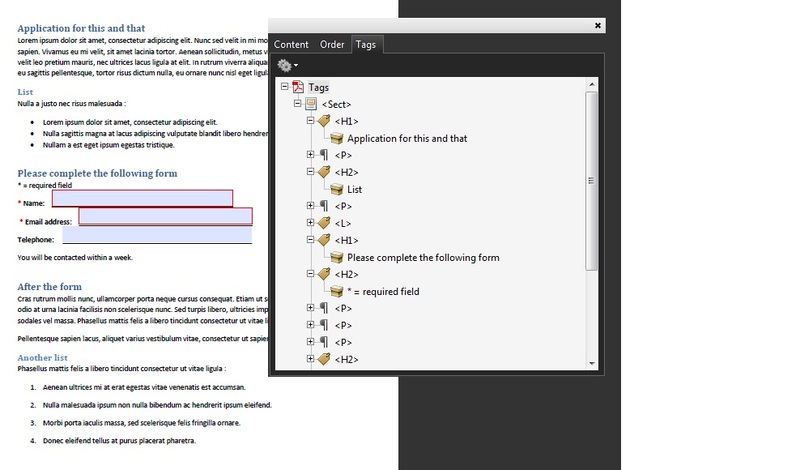 Use Document Structure For tagged documents, moves in the tag order specified by the authoring application. Note: This is usually the correct reading order and will be selected by default for tagged documents. Unspecified If the document was created using an earlier version of Acrobat Pro, the tab order is Unspecified by default. With this setting, form fields are tabbed through first, followed by links and then comments ordered by row. This may not be correct reading order. This example is shown in operation in the working example of setting the tab order (Word file) and working example of setting the tab order (PDF file). If the tagged PDF does not reflow in the correct reading order, you can use the authoring tool to repair reading order problems and re-convert the document to tagged PDF. If you do not have access to the original document and authoring tool, you can use the Order panel in the TouchUp Reading Order tool to resolve reading order problems (see Examples 3 and 4). The following image shows a 2-column document converted to tagged PDF. The following image shows the same 2-column document in reflow view. In the TouchUp Reading Order tool, make sure the Show Page Content Order check box is checked. Each section of contiguous page content appears as a separate highlighted region and is numbered according to its placement in the reading order. Note in the following image, the required-field text precedes the header in the reading order: it should follow the header. These are items 6 and 7 in the content order. Example 6 shows how to repair the order. Cut-and-paste the text to follow the header. In the following image, the reading order is correct for the text and header. That is, the content elements numbered 6 and 7 have been switched into the correct reading order. After this correction all content is in the correct reading order: the text preceding the form, the form fields, and the text following the form. Users can navigate from the text into and out of the form fields, in the correct order. Note: Reordering content with the Order panel is most appropriate for simple text content within a PDF since modifications made with the order panel can affect not only the reading order but the underlying structure of content contained within the PDF. This may impact the z-order for content on a page, including making some content become hidden behind other content. Authors should save their work before using the order panel and verify that the changes do not have adverse effects on the document. This example is shown with Adobe Acrobat Pro. There are other software tools that perform similar functions. See the list of other software tools in PDF Authoring Tools that Provide Accessibility Support (http://trace.wisc.edu/wcag_wiki/index.php?title=PDF_Technology_Notes). Cut-and-paste the H2 tag to follow the H1 tag. In the following image, the reading order is correct for the text and header. That is, the content elements H1 and H2 have been switched into the correct reading order. Read the PDF document with a screen reader or a tool that reads aloud, listening to hear that each element is read in the correct order. Reflow the pages and visually inspect the reading order. Use a tool that exposes the document through the accessibility API, and verify that the reading order is correct. Use the tab key to traverse the focus order in the document. 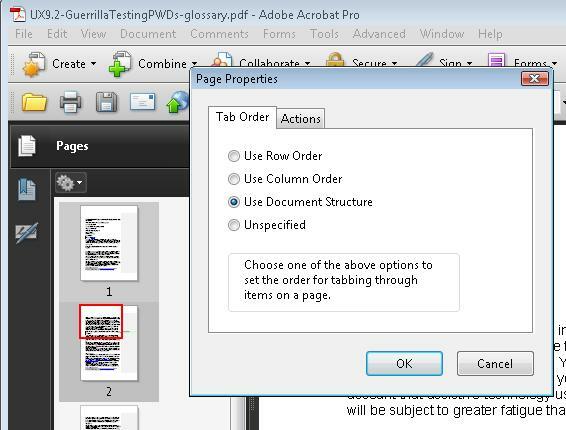 Use a tool that is capable of showing the page object entry that specifies the tab order setting to open the PDF document and view the setting. #1 and Check #2 are true.